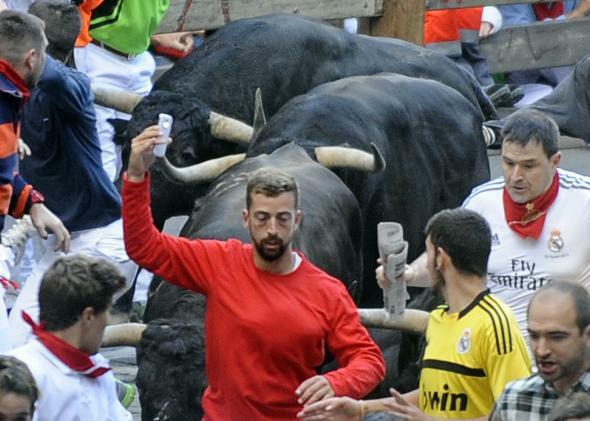 In Pamplona a bull runner faces a fine for taking an illegal, dangerous selfie. When most people run from enormous, stampeding bulls, they really focus on the running. Nothing else matters. Except for this guy (above). Not satisfied with the thrill of participating in Pamplona’s running of the bulls, he added a selfie into the mix just to make sure people knew he had really done it. And now he’s wanted by the cops. The selfie happened on Friday at the end of the fifth bull run of the San Fermín festival. And the Guardian reports that the runner could face as much as 3,000 euro in fines because Pamplona has been trying to discourage this exact type of risk-taking behavior. New regulations passed this year prohibit slowing down and using a recording device during the bull runs. The goal is to reduce dangerous incidents as the bull festival’s fame and international attention increases. The picture has made the rounds on social media, and people are calling the man #eltontolmóvil, or the idiot with the mobile phone, and criticizing him for putting himself and other runners in danger. The festival has had 15 deaths since the early 1900s. (It started in the 13th century, but records from back then are a little murky.) A number of people also get injured every year, an issue that regulations like those from this year are looking to address. The selfie runner is still wanted by Pamplona police.